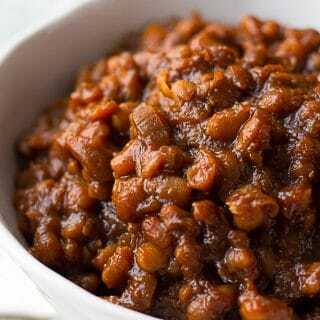 Introducing the most delicious Vegan Baked Beans you will ever eat! 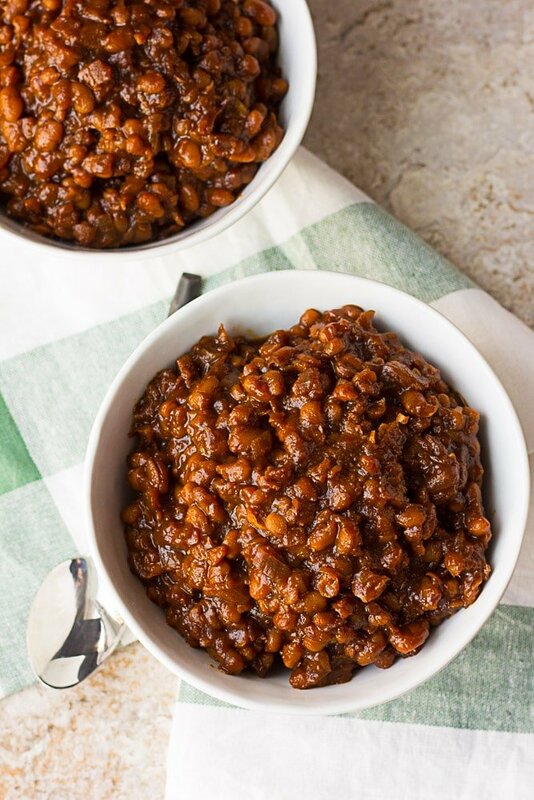 Perfectly cooked from scratch in the Instant Pot, you will never want to buy canned baked beans again. No pre-soaking required! They are sweet and savory, with just a touch of heat, and make the perfect addition to any barbecue. I’m having so much fun with my Instant Pot lately. Do you have one yet? I honestly don’t like having many extra kitchen appliances and tools (for example, my Kitchen Aid mixer is somewhere in the garage right now), but I’ve had my Instant Pot for about a year and a half now, and it’s become one of my favorite things! I use it all the time, so it was definitely worth the purchase. I know, I know, these beans are not actually baked so maybe they should have a different name. But you guys, they taste like they were baked in the oven for hours! 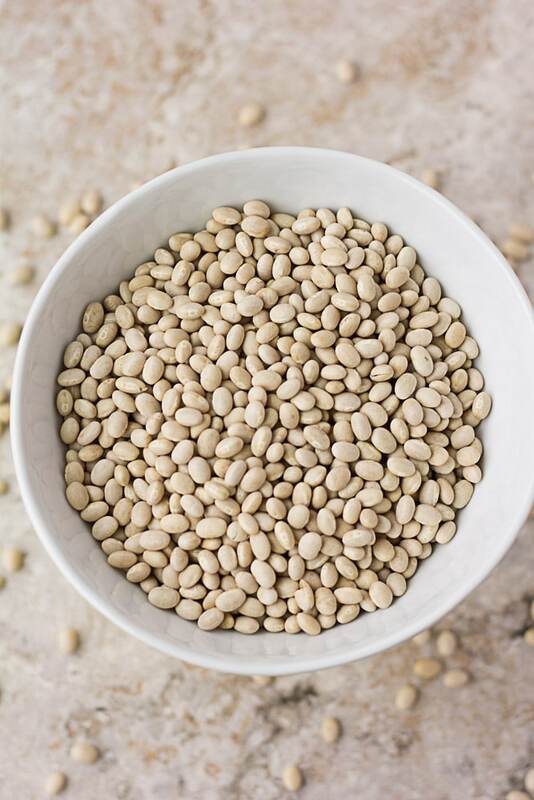 You start with a pound of dried small navy beans. Rinse and drain them. No need to soak! Next, your going to cook the beans in 6 cups of water for an hour. Let them naturally release their pressure, and drain them. In the Instant Pot, saute your onion and garlic for a few minutes, then add the sauce + beans. Cook for 15 minutes and voila! You’ve got the best baked beans you’ve ever tasted in your life! Luckily, this recipe makes quite a bit! So freeze some for future meals, or store in the refrigerator and eat them all week long. 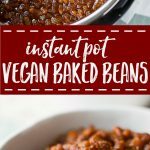 But what should I eat with my Vegan Baked Beans? I’m glad you asked! The perfect combination of savory, sweet and smoky! If you liked this recipe, you may enjoy one of these as well! 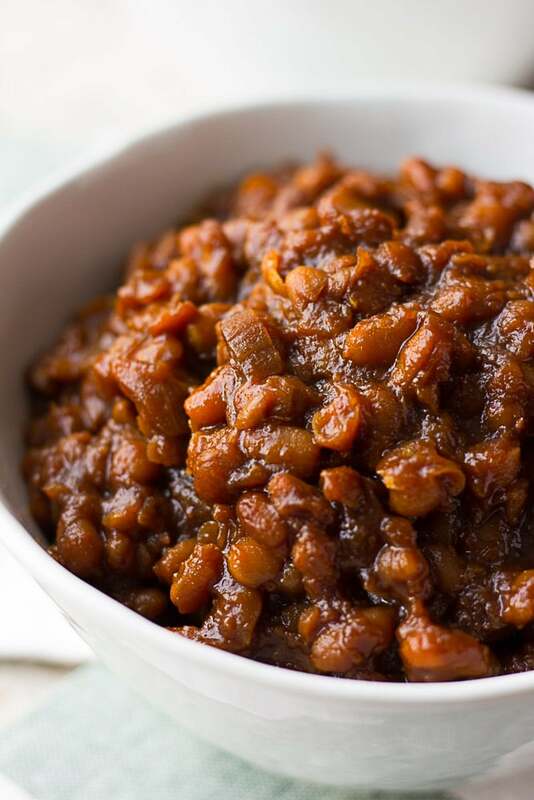 Perfectly cooked from scratch in the Instant Pot, you will never want to buy canned baked beans again. No pre-soaking required! They are sweet and savory, with just a touch of heat, and are the perfect addition to any barbecue. 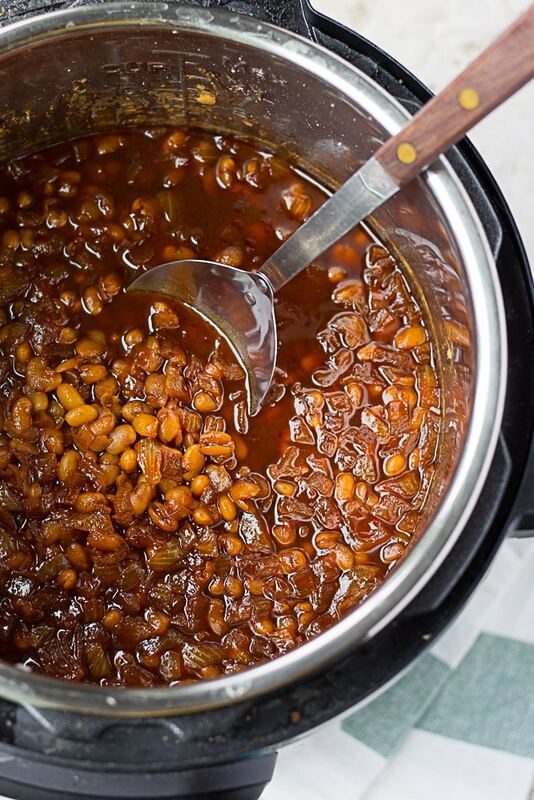 Put the rinsed beans and 6 cups of water into your Instant Pot. Put the lid on, close steam valve and set to the "bean" setting for 25 minutes. Do a natural release when done and carefully drain the beans. Set aside. Whisk all sauce ingredients together in a bowl. Set aside. Pour a few tablespoons of water (or olive oil) into the Instant Pot. Turn the saute setting, and add the onion and garlic. Stir frequently for 2-3 minutes, until the onions have softened. Turn off the saute, and add the sauce and drained beans to the Instant Pot. Give everything a quick stir. Put on the lid, close the steam valve and set to "bean" setting for 15 minutes. Once done, do a natural release and lift the lid carefully. Let sit for 15-30 minutes if possible before serving, as they will thicken up as they sit. Enjoy! If you like your baked beans less sweet, omit or reduce the brown sugar, and use canned tomato sauce in place of the ketchup. 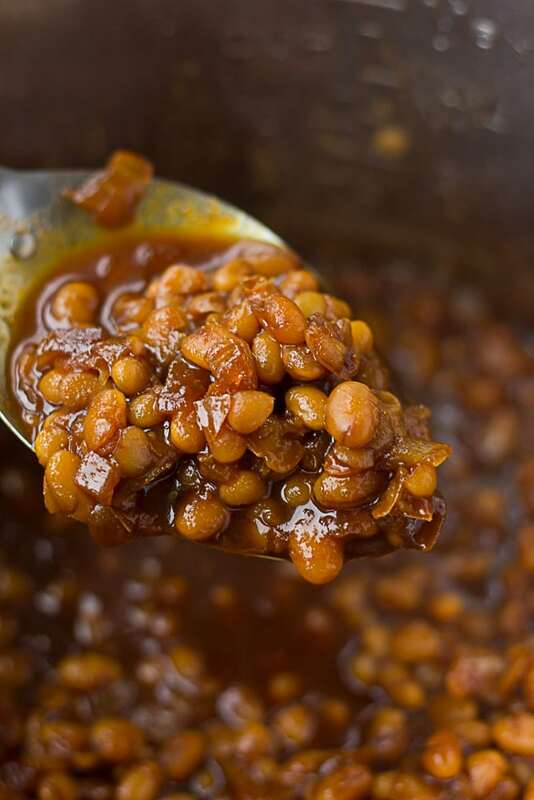 For a BIG shortcut, use canned navy beans that have been drained and rinsed. Pick up the recipe in step two and cut down on cooking time by an hour +! The only ingredient that may be difficult to find is the Vegan Worcestershire Sauce. I use Annie's brand, but if you can't find this you can leave it out.